During the Scientific Revolution, which took place between the 15th and 18th centuries, numerous inventions and discoveries were made that forever changed the way humanity viewed the Universe. And while this explosion in learning owed its existence to countless individuals, a few stand out as being especially worthy of praise and remembrance. One such individual is Gionvanni Domenico Cassini, also known by his French name Jean-Dominique Cassini. An Italian astronomer, engineer, and astrologer, Cassini made many valuable contributions to modern science. However, it was his discovery of the gaps in Saturn’s rings and four of its largest moons for which he is most remembered, and the reason why the Cassini spacecraft bears his name. Giovanni Domenico Cassini was born on June 8th, 1625, in the small town of Perinaldo (near Nice, France) to Jacopo Cassini and Julia Crovesi. Educating by Jesuit scientists, he showed an aptitude for mathematics and astronomy from an early age. In 1648, he accepted a position at the observatory at Panzano, near Bologna, where he was employed by a rich amateur astronomer named Marquis Cornelio Malvasia. During his time at the Panzano Observatory, Cassini was able to complete his education and went on to become the principal chair of astronomy at the University of Bologna by 1650. While there, he made several scientific contributions that would have a lasting mark. This included the calculation of an important meridian line, which runs along the left aisle of the San Petronio Basilica in Bologna. At 66.8 meters (219 ft) in length, it is one of the largest astronomical instruments in the worl and allowed for measurements that were (at the time) uniquely precise. This meridian also helped to settle the debate about whether or not the Universe was geocentric or heliocentric. During his time in Italy, Cassini determined the obliquity of the Earth’s ecliptic – aka. it’s axial tilt, which he calculated to be 23° and 29′ at the time. He also studied the effects of refraction and the Solar parallax, worked on planetary theory, and observed the comets of 1664 and 1668. In recognition of his engineering skills, Pope Clement IX employed Cassini with regard to fortifications, river management and flooding along the Po River in northern Italy. In 1663, Cassini was named superintendent of fortifications and oversaw the fortifying of Urbino. And in 1665, he was named the inspector for the town of Perugia in central Italy. In 1669, Cassini received an invitation by Louis XIV of France to move to Paris and help establish the Paris Observatory. Upon his arrival, he joined the newly-founded Academie Royale des Sciences (Royal Academy of Sciences), and became the first director of the Paris Observatory, which opened in 1671. He would remain the director of the observatory until his death in 1712. In 1673, Cassini obtained his French citizenship and in the following year, he married Geneviève de Laistre, the daughter of the lieutenant general of the Comte de Clermont. During his time in France, Cassini spent the majority of his time dedicated to astronomical studies. Using a series of very long air telescopes, he made several discoveries and collaborated with Christiaan Huygens in many projects. In the 1670s, Cassini began using the triangulation method to create a topographic map of France. It would not be completed until after his death (1789 or 1793), when it was published under the name Carte de Cassini. In addition to being the first topographical map of France, it was the first map to accurately measure longitude and latitude, and showed that the nation was smaller than previously thought. In 1672, Cassini and his colleague Jean Richer made simultaneous observations of Mars (Cassini from Paris and Richer from French Guiana) and determined its distance to Earth through parallax. This enabled him to refine the dimensions of the Solar System and determine the value of the Astronomical Unit (AU) to within 7% accuracy. He and English astronomer Robert Hooke share credit for the discovery of the Great Red Spot on Jupiter (ca. 1665). In 1683, Cassini presented an explanation for “zodiacal light” – the faint glow that extends away from the Sun in the ecliptic plane of the sky – which he correctly assumed to be caused by a cloud of small particles surrounding the Sun. He also viewed eight more comets before his death, which appeared in the night sky in 1672, 1677, 1698, 1699, 1702 (two), 1706 and 1707. In ca. 1690, Cassini was the first to observe differential rotation within Jupiter’s atmosphere. He created improved tables for the positions of Jupiter’s Galilean moons, and discovered the periodic delays between the occultations of Jupiter’s moons and the times calculated. This would be used by Ole Roemer, his colleague at the Paris Observatory, to calculate the velocity of light in 1675. In 1683, Cassini began the measurement of the arc of the meridian (longitude line) through Paris. From the results, he concluded that Earth is somewhat elongated. While in fact, the Earth is flattened at the poles, the revelation that Earth is not a perfect sphere was groundbreaking. The Moon takes the same amount of time to rotate uniformly about its own axis asit takes to revolve around the Earth. As a consequence, the same face is always pointed towards Earth. The point where the lunar orbit passes from south to north on the ecliptic (aka. the ascending node of the lunar orbit) always coincides with the point where the lunar equator passes from north to south on the ecliptic (the descending node of the lunar equator). Thanks to his leadership, Giovanni Cassini was the first of four successive Paris Observatory directors that bore his name. This would include his son, Jaques Cassini (Cassini II, 1677-1756); his grandson César François Cassini (Cassini III, 1714-84); and his great grandson, Jean Dominique Cassini (Cassini IV, 1748-1845). During his time in France, Cassini also made his famous discoveries of many of Saturn’s moons – Iapetus in 1671, Rhea in 167, and Tethys and Dione in 1684. Cassini named these moons Sidera Lodoicea (the stars of Louis), and correctly explained the anomalous variations in brightness to the presence of dark material on one hemisphere (now called Cassini Regio in his honor). In 1675, Cassini discovered that Saturn’s rings are separated into two parts by a gap, which is now called the “Cassini Division” in his honor. He also theorized that the rings were composed of countless small particles, which was proven to be correct. After dedicating his life to astronomy and the Paris Observatory, Cassini went blind in 1711 and then died on September 14th, 1712, in Paris. And although he resisted many new theories and ideas that were proposed during his lifetime, his discoveries and contributions place him among the most important astronomers of the 17th and 18th centuries. Cassini also rejected Newton’s Theory of Gravity, after measurements he conducted which (wrongly) suggested that the Earth was elongated at its poles. After forty years of controversy, Newton’s theory was adopted after the measurements of the French Geodesic Mission (1736-1744) and the Lapponian Expedition in 1737, which showed that the Earth is actually flattened at the poles. For his lifetime of work, Cassini has been honored in many ways by the astronomical community. Because of his observations of the Moon and Mars, features on their respective surfaces were named after him. Both the Moon and Mars have their own Cassini Crater, and Cassini Regio on Saturn’s moon Iapetus also bears his name. Then there is Asteroid (24101) Cassini, which was discovered by C.W. Juels at in 1999 using the Fountain Hills Observatory telescope. Most recently, there was the joint NASA-ESA Cassini-Huygens missions which recently finished its mission to study Saturn and its moons. This robotic orbiter and lander mission was named in honor of the two astronomers who were chiefly responsible for discovering Saturn system of moons. In the end, Cassini’s passion for astronomy and his contributions to the sciences have ensured him a lasting place in the annals of history. In any discussion of the Scientific Revolution and of the influential thinkers who made it happen, his name appears alongside such luminaries as Copernicus, Galileo, and Newton. We have written many interesting articles about Giovanni Cassini here at Universe Today. Here’s How Many Moons Does Saturn Have?, The Planet Saturn, Saturn’s Moon Rhea, Saturn’s “Yin-Yang” Moon Iapetus, Saturn’s Moon Dione. For more information, be sure to check out NASA’s Cassini-Huygens mission page, and the ESA’s as well. Astronomy Cast also has some interesting episodes on the subject. Here’s Episode 229: Cassini Mission, and Episode 230: Christiaan Huygens. Thanks to the Cassini mission, a great deal has been learned about Saturn’s system of moons (aka. the Cronian system) in the past decade. Thanks to the presence of an orbiter in the system, astronomers and space exploration enthusiasts have been treated to a seemingly endless stream of images and data, which in turn has enabled us to learn many interesting things about these moons’ appearances, surface features, composition, and history of formation. This is certainly true of Saturn’s bright moon of Dione. In addition to being the 15th largest moon in the Solar System, and more massive than all known moons smaller than itself combined, it has much in common with other Cronian satellites – like Tethys, Iapetus and Rhea. This includes being mainly composed of ice, having a synchronous rotation with Saturn, and an unusual coloration between its leading and trailing hemispheres. Dione was first observed by Italian astronomer Giovanni Domenico Cassini on in 1684 using a large aerial telescope he set up on the grounds of the Paris Observatory. Along with the moons of Iapetus, Rhea and Tethys – which he had discovered in 1671, 1672 and 1684, respectively – he named these moons Sidera Lodoicea (“Stars of Louis”, after his patron, King Louis XIV of France). These names, however, did not catch on outside of France. By the end of the 17th century, astronomers instead fell into the habit of naming Saturn’s then-known moons as Titan and Saturn I through V, in order of their observed distance from the planet. Being the second most-distant (behind Tethys) Dione came to be known as Saturn II for over a century. The modern names were suggested in 1847 by John Herschel (the son of famed astronomer William Herschel), who suggested all the moons of Saturn be named after Titans – the sons and daughters of Cronos in the Greek mythology (the equivalent of the Roman Saturn). In his 1847 publication, Results of Astronomical Observations made at the Cape of Good Hope, he suggested the name Dione, an ancient oracular Titaness who was the wife of Zeus and the mother of Aphrodite. Dione is featured in Homer’s The Iliad, and geological features – such as craters and cliffs – take their names from people and places in Virgil’s Aeneid. With a mean radius of 561.4 ± 0.4 km and a mass of about 1.0954 × 1021 kg, Dione is equivalent in size to 0.088 Earths and 0.000328 times as massive. It orbits Saturn at an average distance (semi-major axis) of 377,396 km, with a minor eccentricity of 0.0022 – ranging from 376,566 km at periapsis and 378,226 km at apoapsis. Dione’s semi-major axis is about 2% less than that of the Moon. However, reflecting Saturn’s greater mass, Dione’s orbital period is one tenth that of the Moon (2.736915 days compared to 28). Dione is currently in a 1:2 mean-motion orbital resonance with Saturn’s moon Enceladus, completing one orbit of Saturn for every two orbits completed by Enceladus. This resonance maintains Enceladus’s orbital eccentricity (0.0047) and provides tidal flexing that powers Enceladus’ extensive geological activity (which in turn powers its cryovolcanic jets). Dione has two co-orbital (aka. trojan) moons: Helene and Polydeuces. They are located within Dione’s Lagrangian points, 60 degrees ahead of and behind it, respectively. With a mean density of 1.478 ± 0.003 g/cm³, Dione is composed mainly of water, with a small remainder likely consisting of a silicate rock core. 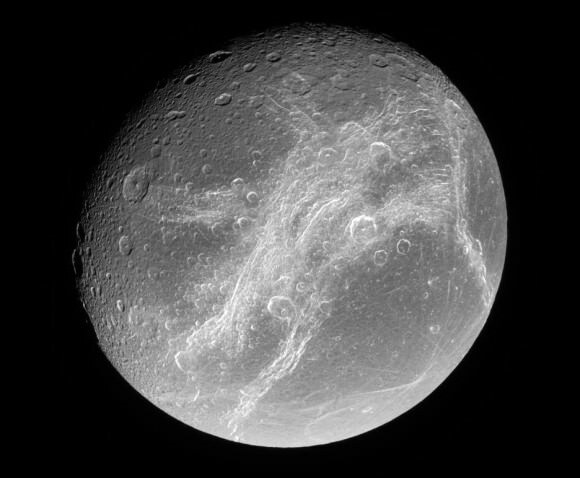 Though somewhat smaller and denser than Rhea, Dione is otherwise very similar in terms of its varied terrain, albedo features, and the different between its leading and trailing hemisphere. Overall, scientists recognize five classes of geological features on Dione – Chasmata (chasms), dorsa (ridges), fossae (long, narrow depressions), craters, and catenae (crater chains). Craters are the most common feature, as with many Cronian moons, and can be distinguished in terms of heavily cratered terrain, moderately cratered plains, and lightly cratered plains. The heavily cratered terrain has numerous craters greater than 100 km (62 mi) in diameter, whereas the plains areas tend to have craters less than 30 km (19 mi) in diameter (with some areas being more heavily cratered than others). Much of the heavily cratered terrain is located on the trailing hemisphere, with the less cratered plains areas present on the leading hemisphere. This is the opposite of what many scientists expected, and suggests that during the period of Heavy Bombardment, Dione was tidally locked to Saturn in the opposite orientation. Because Dione is relatively small, it is theorized that an impact large enough to cause a 35 km crater would have been sufficient to spin the satellite in the opposite direction. Because there are many craters larger than 35 km (22 mi), Dione could have been repeatedly spun during its early history. The pattern of cratering since then and the leading hemisphere’s bright albedo suggests that Dione has remained in its current orientation for several billion years. Dione is also known for its differently colored leading and trailing hemispheres, which are similar to Tethys and Rhea. Whereas its leading hemisphere is bright, its trailing hemisphere is darker and redder in appearance. This is due to the leading hemisphere picking up material from Saturn’s E-Ring, which is fed by Enceladus’ cryovolcanic emissions. Meanwhile, the trailing hemisphere interacts with radiation from Saturn’s magnetosphere, which causes organic elements contained within its surface ice to become dark and redder in appearance. Another prominent feature is Dione’s “wispy terrain“, which covers its trailing hemisphere and is composed entirely of high albedo material that is also thin enough as to not obscure the surface features beneath. The origin of these features are unknown, but an earlier hypothesis suggested that that Dione was geologically active shortly after its formation, a process which has since ceased. During this time of geological activity, endogenic resurfacing could have pushed material from the interior to the surface, with streaks forming from eruptions along cracks that fell back to the surface as snow or ash. Later, after the internal activity and resurfacing ceased, cratering continued primarily on the leading hemisphere and wiped out the streak patterns there. This hypothesis was proven wrong by the Cassini probe flyby of December 13th, 2004, which produced close-up images. These revealed that the ‘wisps’ were, in fact, not ice deposits at all, but rather bright ice cliffs created by tectonic fractures (chasmata). During this flyby, Cassini also captured oblique images of the cliffs which showed that some of them are several hundred meters high. Dione also has a very thin atmosphere of oxygen ions (O+²), which was first detected by the Cassini space probe in 2010. This atmosphere is so thin that scientists prefer to call it an exosphere rather than a tenuous atmosphere. The density of molecular oxygen ions determined from the Cassini plasma spectrometer data ranges from 0.01 to 0.09 per cm3 . Unfortunately, the prevalence of water molecules in the background (from Saturn’s E-Ring) obscured detection of water ice on the surface, so the source of oxygen remains unknown. However, photolysis is a possible cause (similar to what happens on Europa), where charged particles from Saturn’s radiation belt interact with water ice on the surface to create hydrogen and oxygen, the hydrogen being lost to space and the oxygen retained. Dione was first imaged by the Voyager 1 and 2 space probes as they passed by Saturn on their way to the Outer Solar System in 1980 and 1981, respectively. Since that time, the only probe to conduct a flyby or close-up imaging of Dione has been the Cassini orbiter, which conducted five flybys of the moon between 2005 and 2015. The first close flyby took place on October 11th, 2005, at a distance of 500 km (310 mi), followed by another on April 7th, 2010, (again at a distance of 500 km). A third flyby was performed on December 12th, 2011, and was the closest, at an distance of 99 km (62 mi). The fourth and fifth flybys took place on June 16th and August 17th, 2015, at a distance of 516 km (321 mi) and 474 km (295 mi), respectively. In addition to obtaining images of Cassini’s cratered and differently-colored surface, the Cassini mission was also responsible for detecting the moon’s tenuous atmosphere (exosphere). Beyond that, Cassini also provided scientists with new evidence that Dione could be more geologically active than previously predicted. Based on models constructed by NASA scientists, it is now believed that Dione’s core experiences tidal heating, which increases the closer it gets to Saturn. Because of this, scientists also believe that Dione may also have a liquid water ocean at its core-mantle boundary, thus joining moons like Enceladus, Europa and others in being potential environments where extra-terrestrial life could exist. This, as well as Dione’s geological history and the nature of its surface (which could be what gives rise to its atmosphere) make Dione a suitable target for future research. Though no missions to study the moon are currently being planned, any mission to the Saturn system in the coming years would likely include a flyby or two! We have many great articles on Dione and Saturn’s moons here at Universe Today. Here is one about Cassini’s first flyby, its closest flyby, it’s possible geological activity, its canyons, and its wispy terrain. Universe Today also has an interview with Dr. Kevin Grazier, a member of the Cassini-Huygens mission. Saturn is well known for being a gas giant, and for its impressive ring system. But would it surprise you to know that this planet also has the second-most moons in the Solar System, second only to Jupiter? Yes, Saturn has at least 150 moons and moonlets in total, though only 62 have confirmed orbits and only 53 have been given official names. Most of these moons are small, icy bodies that are little more than parts of its impressive ring system. In fact, 34 of the moons that have been named are less than 10 km in diameter while another 14 are 10 to 50 km in diameter. However, some of its inner and outer moons are among the largest and most dramatic in the Solar System, measuring between 250 and 5000 km in diameter and housing some of greatest mysteries in the Solar System. Saturn’s moons have such a variety of environments between them that you’d be forgiven for wanting to spend an entire mission just looking at its satellites. From the orange and hazy Titan to the icy plumes emanating from Enceladus, studying Saturn’s system gives us plenty of things to think about. Not only that, the moon discoveries keep on coming. As of April 2014, there are 62 known satellites of Saturn (excluding its spectacular rings, of course). Fifty-three of those worlds are named. Prior to the invention of telescopic photography, eight of Saturn’s moons were observed using simple telescopes. The first to be discovered was Titan, Saturn’s largest moon, which was observed by Christiaan Huygens in 1655 using a telescope of his own design. Between 1671 and 1684, Giovanni Domenico Cassini discovered the moons of Tethys, Dione, Rhea and Iapetus – which he collectively named the “Sider Lodoicea” (Latin for “Louisian Stars”, after King Louis XIV of France). n 1789, William Herschel discovered Mimas and Enceladus, while father-and-son astronomers W.C Bond and G.P. Bond discovered Hyperion in 1848 – which was independently discovered by William Lassell that same year. By the end of the 19th century, the invention of long-exposure photographic plates allowed for the discovery of more moons – the first of which Phoebe, observed in 1899 by W.H. Pickering. In 1966, the tenth satellite of Saturn was discovered by French astronomer Audouin Dollfus, which was later named Janus. A few years later, it was realized that his observations could only be explained if another satellite had been present with an orbit similar to that of Janus. This eleventh moon was later named Epimetheus, which shares the same orbit with Janus and is the only known co-orbital in the Solar System. By 1980, three additional moons were discovered and later confirmed by the Voyager probes. They were the trojan moons (see below) of Helene (which orbits Dione) as well as Telesto and Calypso (which orbit Tethys). The study of the outer planets has since been revolutionized by the use of unmanned space probes. This began with the arrival of the Voyager spacecraft to the Cronian system in 1980-81, which resulted in the discovery of three additional moons – Atlas, Prometheus, and Pandora – bringing the total to 17. By 1990, archived images also revealed the existence of Pan. This was followed by the Cassini-Huygens mission, which arrived at Saturn in the summer of 2004. Initially, Cassini discovered three small inner moons, including Methone and Pallene between Mimas and Enceladus, as well as the second Lagrangian moon of Dione – Polydeuces. In November of 2004, Cassini scientists announced that several more moons must be orbiting within Saturn’s rings. From this data, multiple moonlets and the moons of Daphnis and Anthe have been confirmed. The study of Saturn’s moons has also been aided by the introduction of digital charge-coupled devices, which replaced photographic plates by the end of the 20th century. Because of this, ground-based telescopes have begun to discovered several new irregular moons around Saturn. In 2000, three medium-sized telescopes found thirteen new moons with eccentric orbits that were of considerable distance from the planet. In 2005, astronomers using the Mauna Kea Observatory announced the discovery of twelve more small outer moons. In 2006, astronomers using Japan’s Subaru Telescope at Mauna Kea reported the discovery of nine more irregular moons. In April of 2007, Tarqeq (S/2007 S 1) was announced, and in May of that same year, S/2007 S 2 and S/2007 S 3 were reported. The modern names of Saturn’s moons were suggested by John Herschel (William Herschel’s son) in 1847. In keeping with the nomenclature of the other planets, he proposed they be named after mythological figures associated with the Roman god of agriculture and harvest – Saturn, the equivalent of the Greek Cronus. In particular, the seven known satellites were named after Titans, Titanesses and Giants – the brothers and sisters of Cronus. In 1848, Lassell proposed that the eighth satellite of Saturn be named Hyperion after another Titan. When in the 20th century, the names of Titans were exhausted, the moons were named after different characters of the Greco-Roman mythology, or giants from other mythologies. All the irregular moons (except Phoebe) are named after Inuit and Gallic gods and Norse ice giants. 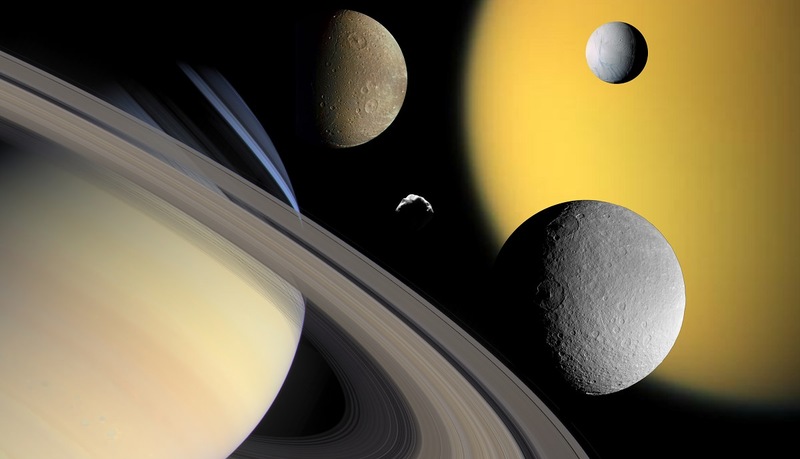 Saturn’s moons are grouped based on their size, orbits, and proximity to Saturn. The innermost moons and regular moons all have small orbital inclinations and eccentricities and prograde orbits. Meanwhile, the irregular moons in the outermost regions have orbital radii of millions of kilometers, orbital periods lasting several years, and move in retrograde orbits. Saturn’s Inner Large Moons, which orbit within the E Ring (see below), include the larger satellites Mimas, Enceladus, Tethys, and Dione. These moons are all composed primarily of water ice, and are believed to be differentiated into a rocky core and an icy mantle and crust. With a diameter of 396 km and a mass of 0.4×1020 kg, Mimas is the smallest and least massive of these moons. It is ovoid in shape and orbits Saturn at a distance of 185,539 km with an orbital period of 0.9 days. Some people jokingly call Mimas the “Death Star” moon because of the crater in its surface that resembles the machine from the Star Wars universe. The 140 km (88 mi) Herschel Crater is about a third the diameter of the moon itself, and could have created fractures (chasmata) on the moon’s opposing side. There are in fact craters throughout the moon’s small surface, making it among the most pockmarked in the Solar System. Enceladus, meanwhile, has a diameter of 504 km, a mass of 1.1×1020 km and is spherical in shape. It orbits Saturn at a distance of 237,948 km and takes 1.4 days to complete a single orbit. Though it is one of the smaller spherical moons, it is the only Cronian moon that is endogenously active – and one of the smallest known bodies in the Solar System that is geologically active. This results in features like the famous “tiger stripes” – a series of continuous, ridged, slightly curved and roughly parallel faults within the moon’s southern polar latitudes. Large geysers have also been observed in the southern polar region that periodically release plumes of water ice, gas and dust which replenish Saturn’s E ring. These jets are one of several indications that Enceladus has liquid water beneath it’s icy crust, where geothermal processes release enough heat to maintain a warm water ocean closer to its core. The moon has at least five different kinds of terrain, a “young” geological surface of less than 100 million years. With a geometrical albedo of more than 140%, which is due to it being composed largely of water ice, Enceladus is one of the brightest known objects in the Solar System. At 1066 km in diameter, Tethys is the second-largest of Saturn’s inner moons and the 16th-largest moon in the Solar System. The majority of its surface is made up of heavily cratered and hilly terrain and a smaller and smoother plains region. Its most prominent features are the large impact crater of Odysseus, which measures 400 km in diameter, and a vast canyon system named Ithaca Chasma – which is concentric with Odysseus and measures 100 km wide, 3 to 5 km deep and 2,000 km long. With a diameter and mass of 1,123 km and 11×1020 kg, Dione is the largest inner moon of Saturn. The majority of Dione’s surface is heavily cratered old terrain, with craters that measure up to 250 km in diameter. However, the moon is also covered with an extensive network of troughs and lineaments which indicate that in the past it had global tectonic activity. It’s covered in canyons, cracking and craters and is coated from dust in the E-ring that originally came from Enceladus. The location of this dust has led astronomers to theorize that the moon was spun about 180 degrees from its original disposition in the past, perhaps due to a large impact. The Large Outer Moons, which orbit outside of the Saturn’s E Ring, are similar in composition to the Inner Moons – i.e. composed primarily of water ice and rock. Of these, Rhea is the second largest – measuring 1,527 km in diameter and 23×1020 kg in mass – and the ninth largest moon of the Solar System. With an orbital radius of 527,108 km, it is the fifth-most distant of the larger moons, and takes 4.5 days to complete an orbit. Like other Cronian satellites, Rhea has a rather heavily cratered surface, and a few large fractures on its trailing hemisphere. Rhea also has two very large impact basins on its anti-Saturnian hemisphere – the Tirawa crater (similar to Odysseus on Tethys) and an as-yet unnamed crater – that measure 400 and 500 km across, respectively. Rhea has at least two major sections, the first being bright craters with craters larger than 40 km (25 miles), and a second section with smaller craters. The difference in these features are believed to be evidence of a major resurfacing event at some time in Rhea’s past. At 5150 km in diameter, and 1,350×1020 kg in mass, Titan is Saturn’s largest moon and comprises more than 96% of the mass in orbit around the planet. Titan is also the only large moon to have its own atmosphere, which is cold, dense, and composed primarily of nitrogen with a small fraction of methane. Scientists have also noted the presence of polycyclic aromatic hydrocarbons in the upper atmosphere, as well as methane ice crystals. The surface of Titan, which is difficult to observe due to persistent atmospheric haze, shows only a few impact craters, evidence of cryovolcanoes, and longitudinal dune fields that were apparently shaped by tidal winds. Titan is also the only body in the Solar System beside Earth with bodies of liquid on its surface, in the form of methane–ethane lakes in Titan’s north and south polar regions. Titan is also distinguished for being the only Cronian moon that has ever had a probe land on it. This was the Huygens lander, which was carried to the hazy world by the Cassini spacecraft. Titan’s “Earth-like processes” and thick atmosphere are among the things that make this world stand out to scientists, which include its ethane and methane rains from the atmsophere and flows on the surface. With an orbital distance of 1,221,870 km, it is the second-farthest large moon from Saturn, and completes a single orbit every 16 days. Like Europa and Ganymede, it is believed that Titan has a subsurface ocean made of water mixed with ammonia, which can erupt to the surface of the moon and lead to cryovolcanism. Hyperion is Titan’s immediate neighbor. At an average diameter of about 270 km, it is smaller and lighter than Mimas. It is also irregularly shaped and quite odd in composition. Essentially, the moon is an ovoid, tan-colored body with an extremely porous surface (which resembles a sponge). The surface of Hyperion is covered with numerous impact craters, most of which are 2 to 10 km in diameter. It also has a highly unpredictable rotation, with no well-defined poles or equator. At 1,470 km in diameter and 18×1020 kg in mass, Iapetus is the third-largest of Saturn’s large moons. And at a distance of 3,560,820 km from Saturn, it is the most distant of the large moons, and takes 79 days to complete a single orbit. Due to its unusual color and composition – its leading hemisphere is dark and black whereas its trailing hemisphere is much brighter – it is often called the “yin and yang” of Saturn’s moons. Beyond these larger moons are Saturn’s Irregular Moons. These satellites are small, have large-radii, are inclined, have mostly retrograde orbits, and are believed to have been acquired by Saturn’s gravity. These moons are made up of three basic groups – the Inuit Group, the Gallic Group, and the Norse Group. The Inuit Group consists of five irregular moons that are all named from Inuit mythology – Ijiraq, Kiviuq, Paaliaq, Siarnaq, and Tarqeq. All have prograde orbits that range from 11.1 to 17.9 million km, and from 7 to 40 km in diameter. They are all similar in appearance (reddish in hue) and have orbital inclinations of between 45 and 50°. The Gallic group are a group of four prograde outer moons named for characters in Gallic mythology -Albiorix, Bebhionn, Erriapus, and Tarvos. Here too, the moons are similar in appearance and have orbits that range from 16 to 19 million km. Their inclinations are in the 35°-40° range, their eccentricities around 0.53, and they range in size from 6 to 32 km. Last, there is the Norse group, which consists of 29 retrograde outer moons that take their names from Norse mythology. These satellites range in size from 6 to 18 km, their distances from 12 and 24 million km, their inclinations between 136° and 175°, and their eccentricities between 0.13 and 0.77. This group is also sometimes referred to as the Phoebe group, due to the presence of a single larger moon in the group – which measures 240 km in diameter. The second largest, Ymir, measures 18 km across. Within the Inner and Outer Large Moons, there are also those belonging to Alkyonide group. These moons – Methone, Anthe, and Pallene – are named after the Alkyonides of Greek mythology, are located between the orbits of Mimas and Enceladus, and are among the smallest moons around Saturn. Some of the larger moons even have moons of their own, which are known as Trojan moons. For instance, Tethys has two trojans – Telesto and Calypso, while Dione has Helene and Polydeuces. It is thought that Saturn’s moon of Titan, its mid-sized moons and rings developed in a way that is closer to the Galilean moons of Jupiter. In short, this would mean that the regular moons formed from a circumplanetary disc, a ring of accreting gas and solid debris similar to a protoplanetary disc. Meanwhile, the outer, irregular moons are believed to have been objects that were captured by Saturn’s gravity and remained in distant orbits. However, there are some variations on this theory. In one alternative scenario, two Titan-sized moons were formed from an accretion disc around Saturn; the second one eventually breaking up to produce the rings and inner mid-sized moons. In another, two large moons fused together to form Titan, and the collision scattered icy debris that formed to create the mid-sized moons. However, the mechanics of how the moon’s formed remains a mystery for the time being. With additional missions mounted to study the atmospheres, compositions and surfaces of these moons, we may begin to understand where they truly came from. Much like Jupiter, and all the other gas giants, Saturn’s system of satellites is extensive as it is impressive. In addition to the larger moons that are believed to have formed from a massive debris field that once orbited it, it also has countless smaller satellites that were captured by its gravitational field over the course of billions of years. One can only imagine how many more remain to be found orbiting the ringed giant. We have many great articles on Saturn and its moon’s here at Universe Today. For example, here’s How Many Moons Does Saturn Have? and Is Saturn Making a New Moon? Here’s an article about the discovery of Saturn’s 60th moon, and another article about how Saturn’s moons could be creating new rings. Want more information about Saturn’s moons? Check out NASA’s Cassini information on the moons of Saturn, and more from NASA’s Solar System Exploration site. Dr. Kevin Grazier was a planetary scientist with the Cassini mission for over 15 years, studying Saturn and its icy rings. He was also the science advisor for Battlestar Galactica, Eureka and the movie Gravity. Mike Brown is a professor of planetary astronomy at Caltech. He’s best known as the man who killed Pluto, thanks to his team’s discovery of Eris and other Kuiper Belt Objects. We recently asked them about many things – here’s what they shared with us about the rings of Saturn. Saturn’s majestic, iconic rings define the planet, but where did they come from? That’s Dr. Kevin Grazier, a planetary scientist who worked on NASA’s Cassini mission or over 15 years, studying Saturn’s rings extensively. And that’s Mike Brown, professor of planetary geology at Caltech, who studies many of the icy objects in the Solar System. Saturn and its rings, as seen from above the planet by the Cassini spacecraft. Credit: NASA/JPL/Space Science Institute. Assembled by Gordan Ugarkovic. Saturn’s rings start just 7,000 km above the surface of the planet, and extend out to an altitude of 80,000 km. But they’re gossamer thin, just 10 km across at some points. We’ve known about Saturn’s rings since 1610, when Galileo was the first person to turn a telescope on them. The resolution was primitive, and he thought he saw “handles” attached to Saturn, or perhaps what were big moons on either side. In 1659, using a better telescope, the Dutch astronomer Christiaan Huygens figured out that these “handles” were actually rings. And finally in the 1670s, the Italian astronomer Giovanni Cassini was able to resolve the rings in more detail, even observed the biggest gap in the rings. The Cassini mission, named after Giovanni, has been with Saturn for almost a decade, allowing us to view the rings in incredible detail. Determining the origin and evolution of Saturn’s rings has been one of its objectives. Saturn’s rings. Credit: NASA/JPL/Space Science Institute. Evidence from NASA’s Voyager spacecraft indicated that the material in Saturn’s rings was young. Perhaps a comet shattered one of Saturn’s moons within the last few hundred million years, creating the rings we see today. If that was the case case, what incredible luck that we’re here to see the rings in their current form. But when Cassini arrived, it showed evidence that Saturn’s rings are being refreshed, which could explain why they appear so young. Perhaps they are ancient after all. Enceladus, backdropped by Saturn’s rings. Credit: NASA/JPL/ Space Science Institute. In 2005, scientist discovered that Saturn’s E-Ring is being constantly replenished by the moon Enceladus. Cryovolcanoes spew water ice into space from a series of fissures at its south pole. So where did Saturn’s rings come from? We don’t know. Are the new or old? We don’t know. It just another great mystery of the Solar System. You can follow Kevin Grazier and Mike Brown at their Google+ pages!